So you think you know everything there is about the Rosary? That’s what I thought when I received the book, Praying the Rosary Like Never Before, but wow, was I wrong. I’ve done studies by Dr. Edward Sri, and even met him in person. He has a very bright personality and always has a smile on his face. He also loves talking about his wife and kids, and of course, he loves talking about our faith. Dr. Sri begins the book by breaking down why we pray the Rosary and what can cause us to stop praying it. His explanations are clear and concise. On the chapter about if the Rosary gives too much attention to Mary, Sri writes, “As a father, I do not view my children’s love for each other as competition for love and attention that should be given to me. Rather, I rejoice all the more when I see my children asking each other for help and lovingly responding to each other’s needs. In a similar way, our heavenly Father rejoices when he sees his sons and daughters loving each other so much that they ask each other for prayer and intercede for each other’s needs.” (Sri, 21) This is something I can relate to as a mother, but also something I’ve never thought of prayer in such a way before. The last few chapters covers in depth each of the mysteries of the Rosary and the biblical meaning of each event. Again, this debunks the theory that the Rosary is focused too much on Mary, in the fact that the majority of the mysteries we are to ponder focuses upon an event in Jesus’ life. The mysteries that focus upon Mary contemplate who Mary was, how her life was changed by being the Mother of God, and what we too get to look forward to if we are a Child of God. This book would be a wonderful small group study book, in that the chapters are short and there are discussion questions at the end of each chapter that will help facilitate good discussion among the group, without being too personal. 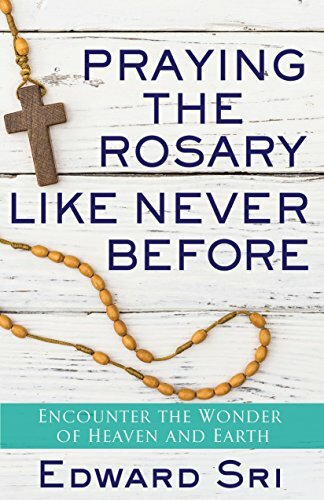 Praying the Rosary Like Never Before, by Dr. Edward Sri, would be a great book to bring to your prayer time and will help you fall completely in love with the Rosary!